On 28 June 2017, the Securities and Futures Commission (SFC) published its consultation proposals on the legal and regulatory requirements for the Open-ended Fund Company (OFC) structure. The consultation follows the approval of the Securities and Futures (Amendment) Bill 2016 (Amendment Ordinance) (see archive), which introduced the new structure to enable investment funds to be established in Hong Kong in corporate form. The new fund structure is aimed at increasing Hong Kong’s attractiveness as a fund domicile and is part of a broader strategy to develop it as a full-service asset management centre. In formulating the code and rules, the SFC has adopted a principle-based rather than a prescriptive approach for the framework in order to facilitate flexibility in OFCs’ operations. The consultation is open for two months and responses should be submitted by 28 August 2017. An OFC’s instrument of incorporation must include certain mandatory provisions. The SFC has been empowered by the Amendment Ordinance to make subsidiary legislation and to issue codes and guidelines in relation to the regulation of OFCs. The proposed Securities and Futures (Open-ended Fund Companies) Rules (OFC Rules) and Code on Open-ended Fund Companies (OFC Code) will set out the detailed legal and regulatory requirements for new OFC vehicles. All OFCs will be required to be registered by the SFC under the new Part IVA of the SFO and will be subject to the OFC Rules and OFC Code. OFCs which are intended to be offered to the public (public OFCs) will also have to obtain the SFC’s authorisation under Part IV of the SFO unless an exemption applies, and will be subject to the requirements of the SFC Products Handbook. The non-statutory OFC Code under the SFO will contain Section I which will apply to all OFCs, while Section II will apply only to non-public OFCs (private OFCs). The SFC proposes a one-stop processing for registration, incorporation and business registration, where an OFC will only have to deal directly with the SFC. The SFC will notify the CR of the OFC’s registration, and the SFC registration will take effect upon the issuance of a certificate of incorporation by the CR. The same approach would apply to business registration with the Inland Revenue Department. The name of an OFC will have to end with “open-ended fund company” or OFC, must not be the same as another existing OFC, and must not be misleading or undesirable. The OFC’s name and any subsequent change to it will be reviewed and approved by the SFC only. The process for a change of name will also adopt the one-stop approach. Under Part XIVA in the Amendment Ordinance, an OFC must have an instrument of incorporation containing certain mandatory contents. The draft OC Rules propose that the instrument of incorporation must include a statement that the object of the OFC is the operation of the company as a collective investment scheme. The objects of the OFC must also include a statement that the OFC is formed for a lawful purpose. The template of an OFC instrument of incorporation will be made available on the SFC’s website. An OFC will be provided with the flexibility to alter its instrument of incorporation, but any material change to an OFC’s instrument of incorporation will require the SFC’s approval. The legal capacity of an OFC would be similar to that of a conventional company under the CO. It is also proposed that the OC Rules provide that any transaction entered into by an OFC which falls outside its operation as a collective investment scheme will be invalid. The OFC and its key operators will be required to comply with the following General Principles to be set out in the OFC Code: acting fairly, diligence and competency, proper protection of assets, managing conflicts of interest, disclosure, regulatory compliance, complying with constitutive documents. The first key operators of an OFC would be those named in the OFC’s incorporation form. The circumstances under which the key operators must cease to hold office and the procedures of removal from office should be included in the instrument of incorporation of the OFC and disclosed in its offering documents. An OFC will have to have at least two directors on its board of directors, who are natural persons over 18 years old. An undischarged bankrupt cannot serve as a director of an OFC without the leave of the court. At least one of the directors must be an independent director, who must not be a director or employee of the custodian. The directors will owe the OFC to which they are appointed fiduciary duties and the duty to exercise reasonable care, skill and diligence. The directors of an OFC must comply with their statutory duties and applicable codes and guidelines when discharging their functions in respect of an OFC. Subsequent appointments may be made by the board of the OFC or by way of shareholders’ resolution, subject to SFC approval. The OFC must keep a register of directors and file notice of any change of director with the CR. The CR will keep a current index of directors. An overseas director will have to appoint a process agent to facilitate the services of process. A process agent can be: (a) an individual whose usual residential address is in Hong Kong; (b) a company formed and registered under the CO in Hong Kong; or (c) a firm of solicitors or certified public accountants in Hong Kong. The OFC must keep a record of the process agent. 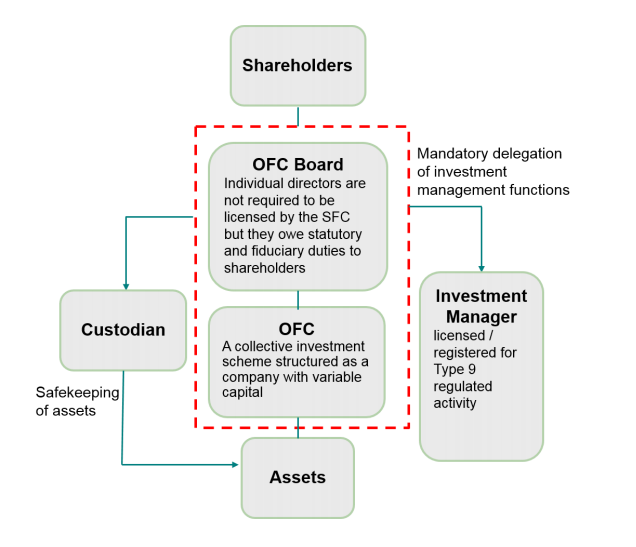 An OFC must delegate its investment management function to an investment manager who has an SFC licence, or is registered with the SFC, to carry out Type 9 (asset management) regulated activity. A delegation agreement in writing must be in place at all times, stating the delegation of the investment management functions to the investment manager. An investment manager must retire when it ceases to meet the eligibility requirements under the SFO. The investment manager must comply with the General Principles and other relevant provisions of the OFC Code. It will also have to comply with the Fund Manager Code of Conduct, the Code of Conduct for Persons Licensed by or Registered with the Securities and Futures Commission, and other applicable SFC codes and guidelines. Part IVA of the Amendment Ordinance requires an OFC to have a custodian to whom all the investment scheme property of the OFC must be entrusted for safe-keeping. The OFC Code proposes that the eligibility requirements for the custodian will be essentially the same as those for the custodians of SFC-authorised funds as set out in the SFC Products Handbook. These include, for example, requirements that the custodian must be a bank licensed in Hong Kong, a trust company which is a subsidiary of such a bank, or an overseas banking institution or its subsidiary acceptable to the SFC. Upon its cessation of office, the custodian will have to provide either a “statement of circumstances” if it considers there are circumstances to be brought to the attention of the OFC’s shareholders or creditors, or a statement to the OFC that there are no such circumstances. The custodian will be responsible for the proper segregation and safekeeping of the OFC’s assets, and will be expected to exercise due care in the selection, appointment and monitoring of its delegates, including sub-custodians. A custodian incorporated outside Hong Kong should appoint a process agent, unless it is a registered non-Hong Kong company under Part 16 of the CO such that it would have an authorised representative to whom documents should be served. The same eligibility requirements and requirements regarding record-keeping and notification of changes that apply to the process agent of an overseas director apply to the process agent of an overseas custodian. Under the proposed OFC Rules, an OFC can issue multiple classes of shares, and provide for the rights attached to its shares in its instrument of incorporation. The rights attached to shares in a class of shares may be varied only in accordance with provisions in the company’s instrument of incorporation for the variation of those rights. A shareholder’s title to the shares of an OFC will be evidenced by entry of the shareholder’s particulars and holdings into the register of shareholders. Share certificates will not need to be issued. Transfers of shares will be conducted by lodging an instrument of transfer with the OFC, and the OFC will have to register the transfer or send a notice of refusal to the transferee and transferor. The register of shareholders must be kept at the registered office of the OFC or such other address as filed with the CR. The register should be kept either in English or in Chinese. A shareholder of an OFC shall have access to his or her own shareholding information in the register. The proposed OFC Rules set out the fundamental matters relating to meetings and resolutions of OFCs, such as the notice period for holding meetings, the passage of resolutions and voting thresholds, and the rights of relevant parties to attend meetings. Detailed meeting logistics are generally expected to be set out in each OFC’s instrument of incorporation. Public OFCs should comply with the relevant requirements in the SFC Products Handbook. The functions of the CR in relation to corporate filings by an OFC, its powers to request information or alter filings, to issue guidelines in relation thereto and to impose sanctions for non-compliance are very similar to those under the CO. There will be two types of filings with the CR: Type 1, which are the filings that require the SFC’s approval, and Type 2, which will not require SFC approval. Under Part IVA of the Amendment Ordinance, the directors of the OFC must appoint an auditor for each financial year. The proposed OFC Rules require that the auditor must be independent of the investment manager, the custodian, and the directors of the OFC. The auditor should have the right to attend and be heard at general meetings, the right of access to information and other relevant qualified privileges. The auditor may either resign or be removed by an ordinary resolution at a general meeting. The proposed OFC Rules set out provisions as to the auditor’s eligibility, rights and cessation of office which are similar to those for conventional companies. An OFC must prepare an annual report for each financial year, unless it has obtained approval from the SFC that a financial report is not required. The accounts in the annual report must include the financial statements of the OFC, and the auditor’s report on the financial statements. Annual reports must be published within four months of the end of the OFC’s financial year. In preparing its accounts, the OFC may apply Hong Kong Financial Reporting Standards or International Financial Reporting Standards. All public OFCs must prepare an interim report in accordance with the SFC Products Handbook. Flexibility would be allowed for a private OFC to determine whether an interim report should be prepared. If the contracting party with the OFC succeeds in seizing or attaching or otherwise levying execution against any assets of a sub-fund in respect of a liability which was not incurred on behalf of that sub-fund, it will hold those assets or the proceeds of the sale of such assets on trust for the OFC and will keep those assets or proceeds separate and identifiable as such trust property. Offering documents of the OFC should include a statement on the segregated liability of the sub-funds, and a warning that such protected cells may not be recognised in foreign courts. The OFC Rules also introduce a provision to enable cross sub-fund investments by an umbrella OFC. An OFC may propose to enter into an arrangement or compromise with its creditors, its shareholders or both. The court may order a meeting of creditors or shareholders to be summoned, and require a notice for summoning the meeting to be accompanied with an explanatory statement. Under the proposed OFC Rules, the court may sanction an arrangement or compromise if 75% of the creditors, or shareholders, or both, with whom the arrangement or compromise is proposed to be entered into, agree to such arrangement or compromise. The court has additional powers to facilitate a reconstruction or amalgamation if: (a) the arrangement or compromise is proposed for the purpose of, or in connection with, a scheme for the reconstruction of one or more OFCs; and (b) under the scheme, the property or undertaking of any OFC concerned in the scheme is to be transferred to another OFC. Under Part IVA in the Amendment Ordinance, an OFC can be terminated by an application to the SFC. The proposed OFC Rules provide that the OFC and its key operators should ensure that the termination is carried out fairly, and take due account of the best interests of its shareholders. The directors and investment manager should ensure fair valuation of assets and address any conflicts of interests. There should be adequate disclosure of the termination process to investors in an appropriate and timely manner. The procedures for termination are set out in the Code. They include a requirement to provide the SFC with a termination proposal supported with justifications and a solvency statement, and to provide a notice to shareholders. The OFC should conduct the termination in line with its instrument of incorporation, and should have enough assets to settle the liabilities of the OFC. After the OFC’s assets have been fully distributed to shareholders, an application for termination can be made to the SFC. The SFC may cancel the registration of an OFC where the circumstances under section 112ZI in the Amendment Ordinance occur. The OFC’s registration with the CR will be automatically removed when the cancellation of its registration by the SFC takes effect. The provisions of C(WUMP)O relating to the winding-up of an OFC would be applied to the OFC, with relevant modifications, on a wholesale basis. Modifications will include, among others, enabling the SFC and the custodian to petition for the winding-up of the OFC or a stay of relevant proceedings, and enabling the SFC to receive winding-up related documents in a similar fashion to other parties currently entitled to receive such documents. Section II of the proposed OFC Code sets out basic investment restrictions and disclosure and operational requirements applicable to private OFCs. All public OFCs should comply with the relevant requirements of the SFC Products Handbook instead of Section II. Private OFCs will be allowed the flexibility to pursue their investment strategies as set out in their instrument of incorporation and offering documents. They will only be required to comply with the General Principles as well as the basic requirements set out in Section II with respect to their investment scope, fund operation and disclosure. The investment scope of the private OFCs should be aligned with Type 9 (asset management) regulated activity so that SFC licensing, supervision and enforcement would apply to investment managers of OFCs. This investment scope should be able to accommodate a very substantial part of the asset classes in which private OFCs actually invest. The 10% de minimis limit must be set out in the OFC’s instrument of incorporation. Non-compliance with the 10% de minimis limit will result in a breach of the instrument of incorporation and the draft OFC Code, and the relevant intervention powers of the SFC under the SFO may apply in the case of a contravention. Fund operations, such as pricing, dealing arrangements, valuation, distribution policy, use of leverage and fees and charges should be clearly set out in a private OFC’s instrument of incorporation and offering documents. The offering documents of a private OFC are required to be filed with the SFC following the registration of the OFC, and after any changes are made. Material changes to a private OFC would require the approval of shareholders and the approval of the SFC where the change involves an alteration of the instrument of incorporation, including material changes to the OFC’s investment objectives and policies. Other changes which may reasonably be expected to affect investors’ investment decisions would require prior notice to be provided by the private OFC to its shareholders. Reasonable notification of other investment scheme changes should be provided to the shareholders as soon as reasonably practicable. The SFC will be equipped with investigatory, supervisory and intervention powers, which it may apply in case of non-compliance. The SFC will be able to exercise disciplinary powers under Part IX pf the SFO against the investment manager of an OFC for misconduct which is prejudicial to the interest of the investing public. The SFC may also take enforcement actions against the OFC and its key operators. Sections 112ZK, 112ZL, 112ZM and 11ZN in the Amendment Ordinance.